In connection with our fellow literati, Louis H. Engle, we arise at this time to state that the only time this column appears is just after the Tiger has had a MADE-TITE HOT DAWG. HONEST--THE ONLY REASON WE RUN THIS IS BECAUSE IT CAME WITH THE SNOOTIEST DOGGONE SEAL ON IT. 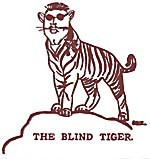 Anyone desiring words with the Blind Tiger peaceful or otherwise are assured that the beastie may be found in the Maroon office between 4:00 P.M. and 4:30 P.M. during the week. Appointments will be made through the Third Business Secretary only. Horsewhips and clubs will be filed in the boxes provided. If your contrib did not appear it may be recovered by application to the janitor, but be sure to see him before the wastebaskets are emptied. Short prose squibs are needed. Scotty says he doesn't like poetry as a steady diet.